This 4 week, clinical rotation offers students the chance to learn how to provide quality healthcare to LGBTQ patients across medical specialties in an outpatient setting. Students will work with physicians and other providers in internal medicine, family medicine, infectious disease, endocrinology, pediatrics, adolescent medicine, OB/GYN, dermatology and psychiatry. A curriculum in line with current AAMC, proficiency-based standards will be presented and students will be given the opportunity to complete an advocacy or research project if desired. A clinical lead will serve to unify the experience and mentor the student towards a career working with LGBTQ patient populations. 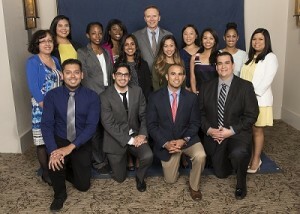 The Oliver Goldsmith, MD Scholarship for the Promotion and Advancement of Culturally Responsive Care honors second- or third-year medical/osteopathic students who have demonstrated commitment to the advancement of culturally responsive care (CRC) through community service, clinical volunteering, or research. Each awardee will receive $5,000 toward his or her education, participate in a mentoring program with a KP clinician and complete a four-to-six week clinical rotation at a KP facility.